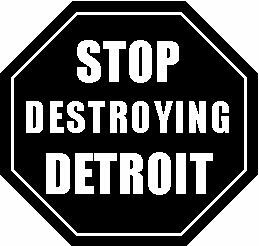 Keep Wayne County residents in their homes! Stop foreclosures of all occupied homes! More than 30,000 occupied homes are facing tax foreclosure in 2016, about the same high number we faced last year. Why? Detroit property taxes are over assessed and have been over assessed for years. The city’s present efforts at reassessment are “too little, too late” for the thousands who have lost their homes in recent auctions or now face foreclosure. The city was obligated to properly assess these properties but didn’t! The right to request reassessment has been limited to a ridiculous two-week period in February. Other cities have reassessed residential properties. We demand proper reassessment, and debt incurred by failure to properly assess be wiped clean! Stop Foreclosures and auctioning of homes based on “fraudulent” assessments! Water bills are added to the property tax. Remove all water bill debt from property tax bills! In a city where 43% live in poverty, the tax department does not notify people that they may be eligible for “poverty” or principle residence exemptions. Eligibility for “poverty” exemptions should be retroactive, and everyone needs to be informed of these exemptions! There are few or no counselors to help people, particularly those with a limited ability to read or whose first language is not English. Persons should be directly contacted, “occupied” homeowners identified, informed of their rights and worked with in the first year of forfeiture. Make independent counseling available! The State of Michigan has just received a new grant of $74 million in Federal Helping Hardest Hit Homeowner assistance, with millions more on the way. These funds, intended to keep families in their homes, must be used to pay delinquent property tax bills for occupied homes, not be diverted for “blight removal” as was done last year. Place an immediate moratorium on tax foreclosures to allow families the opportunity to access these new Step Forward Funds. Make the Banks and Gilbert pay for the blight they caused through their predatory lending policies. We demand an immediate moratorium (Halt) on all owner occupied home foreclosures, until the above and other glaring inequities are addressed!